Saturday April 12th 1902 I had Clarence help me again in the forenoon. He washed and churned for me and did some work in the yard. I ironed in the afternoon and Will helped me set some hens before supper when he came from town. weather clear and cold. 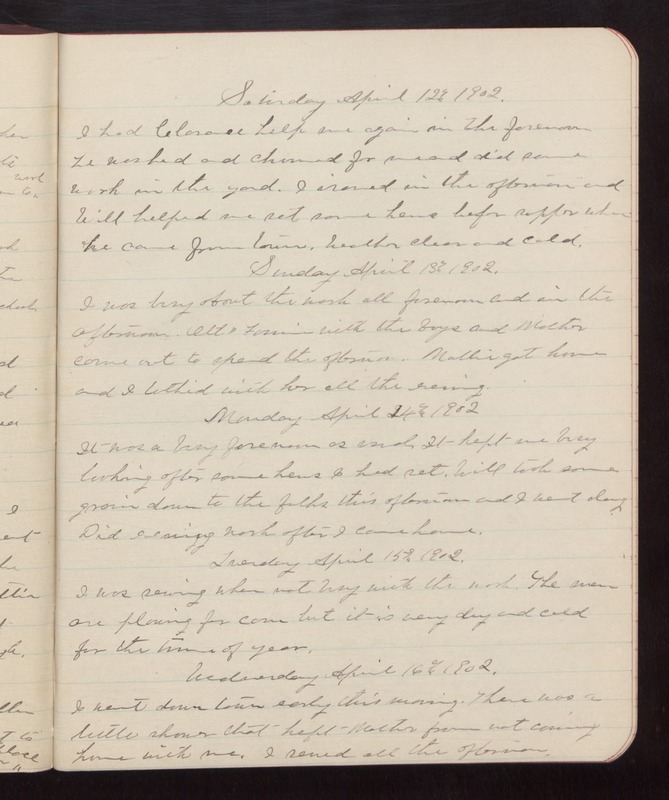 Sunday April 13th 1902 I was busy about the work all forenoon and in the afternoon Ott & Fannie with the boys and Mother came out to spend the afternoon. Mother got home and I talked with her all the evening. Monday April 14th 1902 It was a busy forenoon as usual. It kept me busy looking after some hens I had set. Will took some grain down to the folks this afternoon and I went along. Did evening work after I came home. Tuesday April 15th 1902 I was sewing when not busy with the work. The men are plowing for corn but it is very dry and cold for the time of year. Wednesday April 16th 1902 I went down town early this morning. There was a little shower that kept Mother from not coming home with me. I sewed all the afternoon.